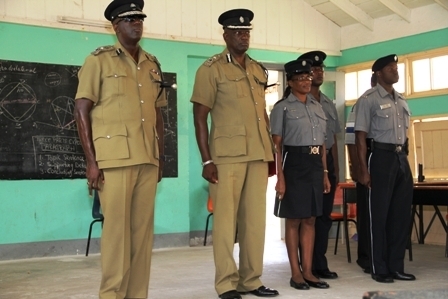 NIA CHARLESTOWN NEVIS (APRIL 25, 2012) — Students of the Joycelyn Liburd Primary and the Gingerland Secondary Schools got the opportunity to be part of an historic encounter with Commissioner of Police in the Royal St. Christopher and Nevis Police Force Celvin G. Walwyn on Tuesday April 24, 2012 when he addressed them. 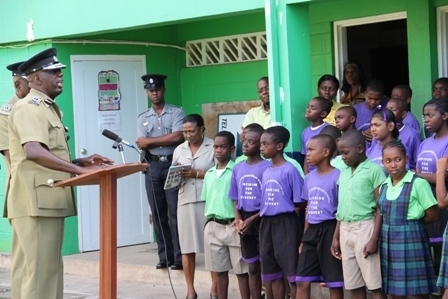 He urged the students to not waste their education and to stay away from bad company and crime. 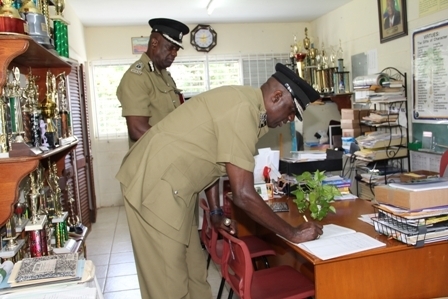 The highest ranking Police Officer in the Federation was accompanied by officer in charge of the Royal St. Christopher and Nevis Police Force Nevis Division, Assistant Commissioner of Police (ASP) Mr. Robert Liburd and new Head of the Gingerland Police Station Sergeant Paulette Bartlette along with other offices under her supervision. “We have a lot of bad influences in this society. We have a lot of guns, we have a lot of drugs [and] we have a lot of violence. You don’t have to become a part of this. You can become somebody special, somebody who can contribute to your society,” he said. Commissioner Walwyn told the students what he was asking of them would not be easy to achieve but they had to do what was right. “One black blemish can stop you from achieving your goals. So the next time somebody comes to you and tells you to do something that you know is wrong, tell them ‘I won’t do it’. Even if they say ‘you are not my friend anymore’, it’s OK, find some other friends,” he said. 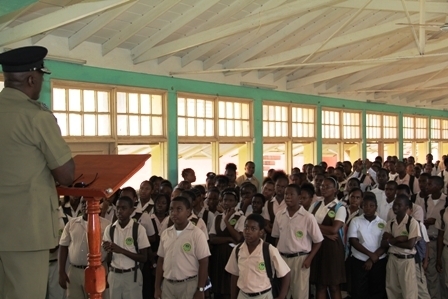 Mr. Walwyn used the opportunity to explain to the students a growing trend that had the potential to affect their future and pointed to situations in which youths of yesterday, now adults of today, were going through. “Let me tell you all something that is happening in the Federation right now. A lot of people your age were committing crimes and they are now your parent’s age and they are trying to go to the United States to get better life for their children but they can’t go because they have criminal records. “You see, your parents told you a long time ago watch what you do and watch the company that you keep. When you do bad things now, they follow you when you get older and you change your mind and you want to do what is right and your parents or relative in America, Canada or England [are] trying to get you over there and get your papers, so you can go and do better for yourself,” he said. The Top Police Officer explained that at the age of 13 he was brought to the Unites States Virgin Islands by his mother but when he got to his early twenties he opted to move to the mainland and did something positive with his life with a Doctorate to show. “Why am I telling you this? You are at an age where you can determine your future…When you do bad things now, and you keep doing bad things, when it’s time for you to get a chance to do something positive and to leave here so you can come back to contribute, you won’t be able to go. “In the last two weeks I have had over 30 men who have had a chance to get a Green Card or to go to Canada to work and they couldn’t go because they have weed smoking, girlfriend beating, robbery, guns all that stuff on their record and those countries will not take you. So my point to you now is at this age I want you to think seriously about everything that you are doing because any hanging with the wrong crowd at this age, can affect you in the future,” he stated. The Commissioner told the students they could be anything they wanted to be in the world but it was up to them and they had to believe that. He added that there were many Kittitians and Nevisians who had left the Federation and had made meaningful differences in other countries they went to because their parents had given them the right training the same as they were receiving. “Do not waste your education here in this school. Learn as much as you can, go out and become whatever you want to be and continue reaching for the stars,” he said. Meantime, Principal of the JLPS Mrs. Marion Lescott and Deputy Principal of the GSS Mr. Shefton Liburd registered gratitude for the Commissioner and his team’s visit to their schools and deemed it a privilege. “ I want to thank you for the words of encouragement that you have given to us as an institution, as a family here at Gingerland Secondary School reminding us especially our children that they are at the stage where the power is in their hand to direct their future. “I trust that our students were attentive, I trust that they have taken in the few words that you have shared with us. You have been very brief I would say in your discourse but it has been a very powerful discourse. Once again I want to say thanks to you for coming to be among us and for speaking with us,” Mr. Liburd said. 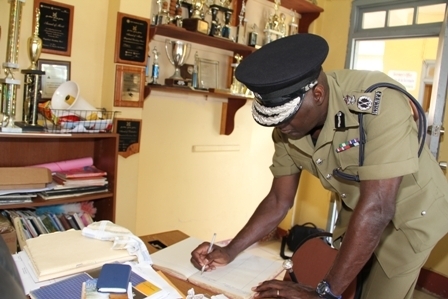 At the end of the visits both Commissioner Walwyn and ASP Liburd were invited to sign the Visitor’s Book at the schools.